A.J. 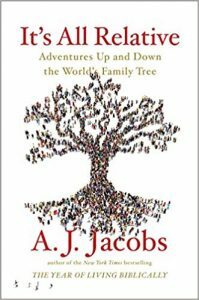 Jacobs Wrote a Book Titled "It's All Relative"
Genealogists and family historians might recognize the name A.J. Jacobs. He is the founder of the Global Family Reunion that took place in 2015 at the site of the 1964 World’s Fair. Since then, he has written a book about his experience as he tried to create the world’s largest family tree. The full title of the book is “It’s All Relative: Adventures Up and Down the World’s Family Tree.” It is about A.J. Jacob’s family – and also your family – because it’s the same family. The concept that will catch the attention of genealogists is the same one that was focused on for the Global Family Reunion. Everyone is related to everyone else. We are all cousins. One could say that A.J. 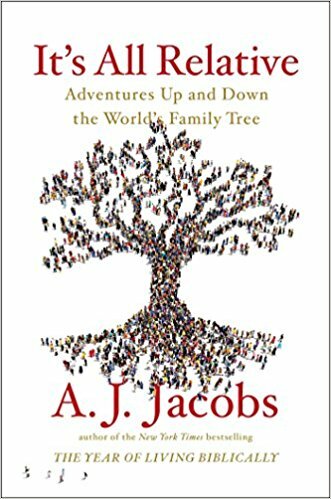 Jacobs stretches the boundaries that define what a cousin is in order to connect everyone together. Overall, it’s a nice, and very welcoming idea, in a world that has become incredibly divided and partisan. Genealogy.com defines first cousin as: “Your first cousins are the people in your family who have two of the same grandparents as you. In other words, they are the children of your aunts and uncles.” This is a concept that even beginning genealogists quickly understand. Things get more complex the farther out you go. Genealogy.com points out: “Your second cousins are the people in your family who have the same great-grandparents as you, but not the same grandparents.” Your third cousins have the same great-great-grandparents as you do. Your fourth cousins have the same great-great-great grandparents as you do. Professional genealogist Megan Smolenyak wrote about her thoughts regarding A.J. Jacob’s concept of cousins on HuffPost. She notes that a strong case has been made that we are all 50th cousins or closer. She also points out that the definition of cousins used for the Global Family Reunion relies heavily on marriage connections. This could lead to incorrect assumptions about how a person is related to another one. Overall, “It’s All Relative” would probably be an interesting read for genealogists who want to know more about the behind-the-scenes situations that resulted in the Global Family Reunion. It might have interesting insights about race and ethnicity that you haven’t considered. * What Affect Does the Global Family Reunion Have on Genealogy? * How Many Cousins Do You Really Have?